In a world awash with new innovations and technological advances, it seems we’re increasingly turning back to nature as a way of escaping the overload of information. As popular as the most promising scientific anti-ageing cream are the basic, simple and effective ingredients that have been relied on for generations – and there’s no doubt that the most current and on-trend of them is coconut oil. Increasingly popular in both food and beauty applications, due to increased research into its benefits over more commonly used oils (such as olive and sunflower,) this sweet smelling substance contains a huge amount of vitamins and minerals (including Choline, Vitamin E, Vitamin K, Iron, Stearic and Lauric Acid) to help nourish the body both inside and out. Whether you choose to use it in its raw format, add it to your beauty products or opt for an already enriched affordable body treat, there’s no doubt this tropical ingredient can offer up huge benefits for the lips, skin, hair and body. Solid at room temperature, but melts when in contact with the skin, coconut oil works as a great dryness-banishing body moisturiser – either alone or when an existing formula is enriched with the hardworking benefits of the oil. 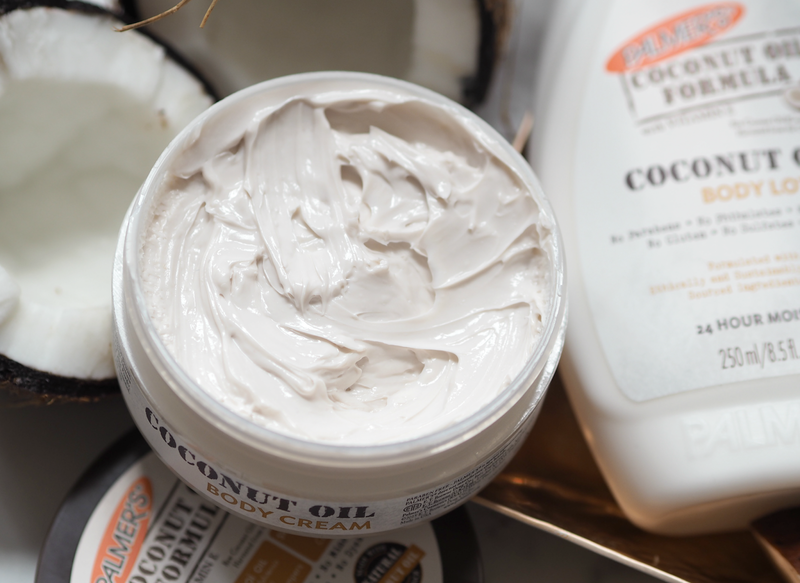 When used on the legs as a shaving oil, it leaves skin soft and glowing; if you find your fake tan is clinging to your elbows and knees, a little coconut oil can help soften the area and create a barrier to banish any crusty orange bits; a great alternative to your usual lip balm, coconut oil provides a glossy shine while helping to repair chapped lips. It’s even able to dissolve waterproof mascara when massaged over the eyes and removed with a cotton pad, as well as being known to help strengthen and lengthen lashes when used regularly as a treatment. If you’re more concerned about your hair, coconut oil can be used as a deep treatment over the whole head (or just for 15 minutes on ends to help dryness) to leave hair looking soft, shiny and healthy; the oil is able to penetrate into hair fibres to help reduce protein loss, strengthen the cuticle and help prevent breakage, making it an easy way to look after your head. 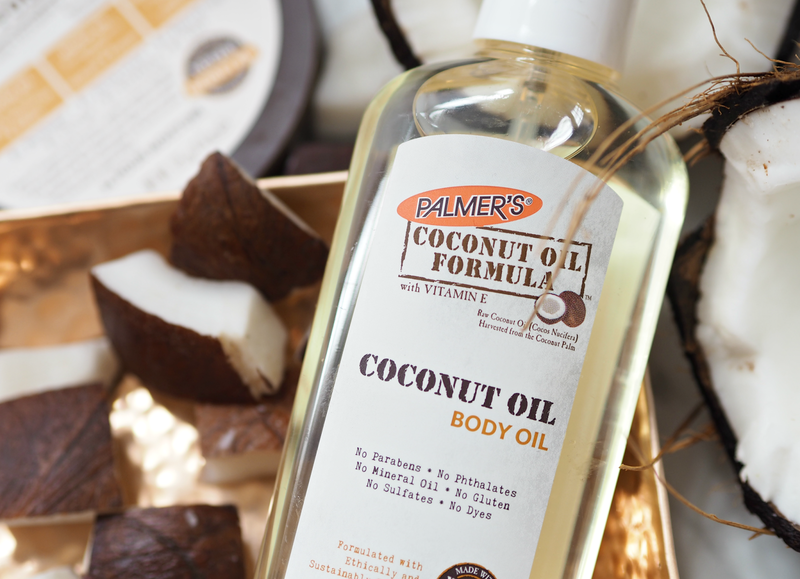 This multi-functional treat should be a staple of any beauty cupboard, but if you don’t fancy having to faff around with a solid pot of oil every day and prefer your body saviours pre-mixed, then Palmer’s Coconut Oil Formula range could be right up your street. 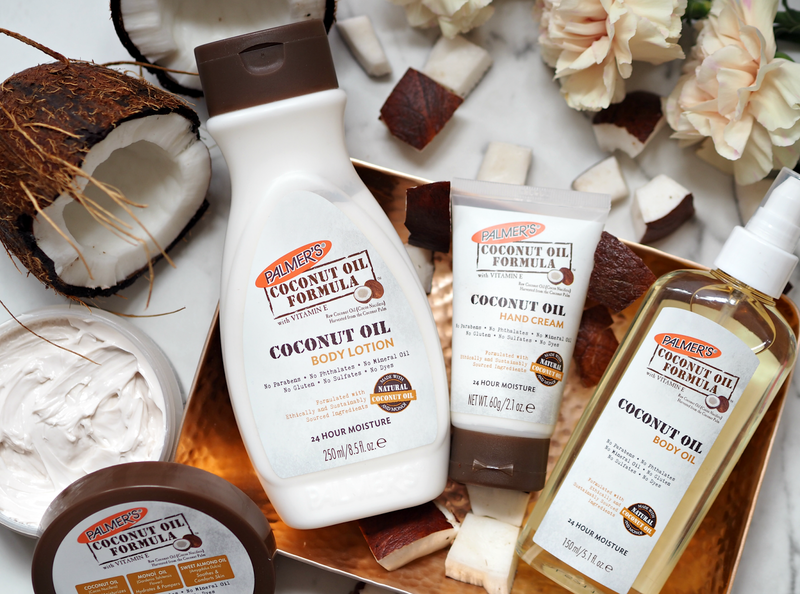 All of the Palmer’s Coconut Oil Formula products contain ethically and sustainably sourced raw coconut oil and Tahitian monoï oil for a deliciously tropical scent. These raw and natural ingredients deliver luxuriously rich moisturisation, to deeply hydrate for up to 24 hours, rejuvenating and replenishing even the most parched and tired of skin; they’re even free from parabens and mineral oil, if you’re making a concerted effort to cut them out of your routine. They provide a little moment of indulgence and a pleasurable sensory experience, even though the price points are incredibly affordable. With four different formats to choose from, there’s an affordable way to nourish you skin whatever your preference. This lightweight oil is perfect for the warmer months when limbs are still on display; a little spritz will not only help nourish skin and leave it feeling supple, but adds a non-greasy subtle sheen that makes the most of that holiday glow. A rich hardworking cream that helps to soothe away any irritating dry bits, works as an overnight treatment on wind-beaten legs or simply targets crusty elbows and knees, the body cream is a must as we step into the new season. Lighter and more suited to your daily morning routine, this lightweight lotion offers the same hydration benefits as the oil and cream but in a different format. A little goes a long way – especially when applied post shower to lock in as much hydration as possible. An on-the-go saviour that can be popped in your bag to keep hands in check 365 days a year, this is one of my all time favourite hand creams. Rich enough to soothe, but light enough to absorb quickly, it doesn’t leave excess residue on hands or create that sticky feeling that we all loathe. Although coconut oil is suited to all regimes throughout the year, as we step into the chillier months and start to battle the elements once again, it’s a great all-round skin saviour that will help you continue to look and feel your best. 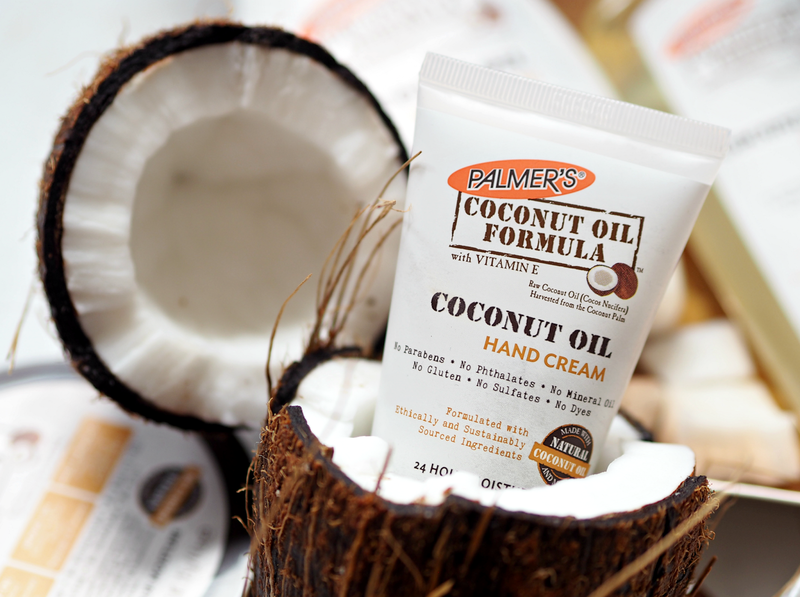 Palmer’s affordable and incredibly effective Coconut Oil Formula products have been firm favourites of mine since they were launched over a year ago (read my original feature here,) and will continue to be throughout the winter. With a scent that reminds me of holidays and beach huts, it’s a momentary distraction from the London rain too! Have you tried coconut oil within your beauty regime? 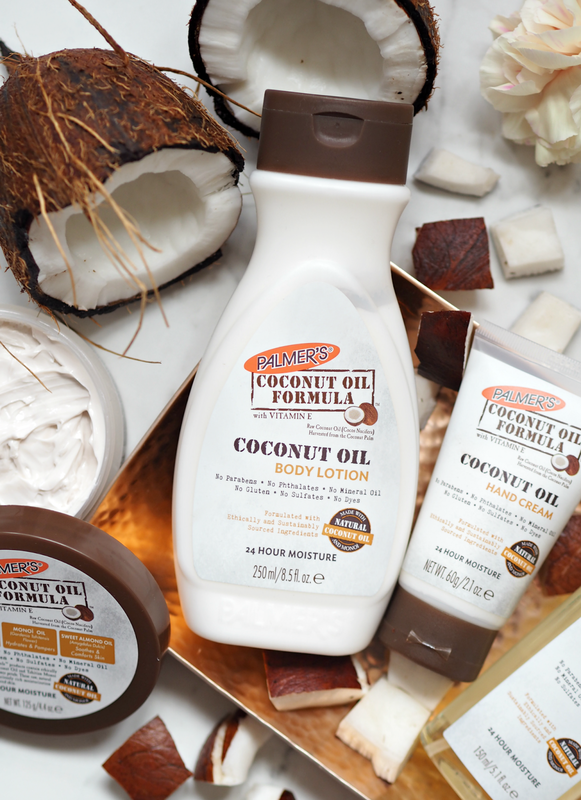 Have you picked up any of the Palmer’s Coconut Oil Formula products already? 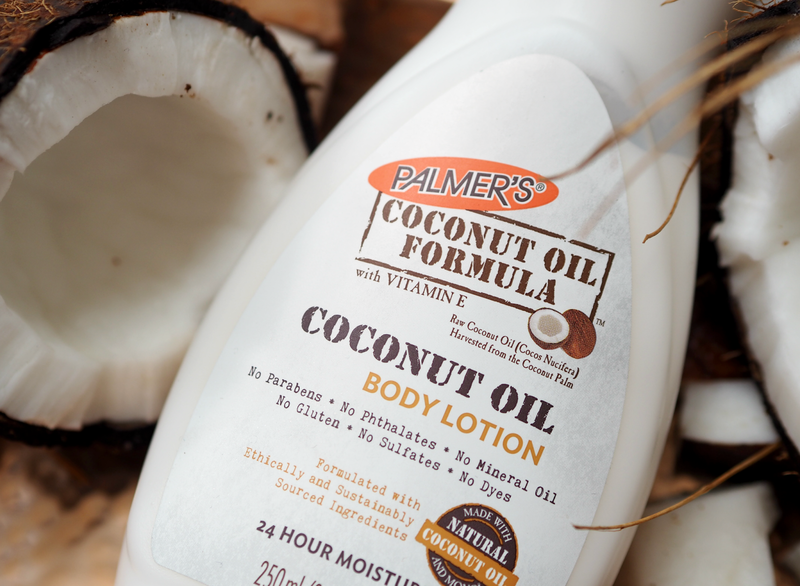 Palmer’s Coconut Oil Formula Body Care range is available to buy from Boots, Superdrug, Sainsbury’s, Feelunique.com and Amazon.co.uk. This is a sponsored post on behalf of Palmer’s; all opinions and recommendations are my own. It's such a good little buy – love all of Palmer's stuff! The hand cream has been a favourite of mine ever since I can remember. Amazing product! I'll soon try some of the other coconut oil products that you mention here. I'm sure they'll be ace! Best part of Coconut Oil is that you can use it for both external as well as internal purpose as you can consume it. I usually used Palmer's product for external purposes and CocoPacific virgin coconut oil for cooking oil.